What are the advantages of cooking with an air fryer? 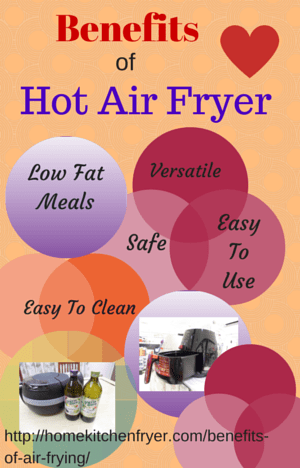 What are the benefits of hot air frying? You have to see the benefits before splurging on another kitchen appliance that can cost anything from $100 to almost $400 USD, right? Can you really cook healthy meals in the hot air fryer? Check out these top 10 benefits of air frying and you’ll want one too. 1 What is a good air fryer? You do not have to add any oil when air frying frozen food stuff meant for baking. Just take it from the freezer and put it straight into the air fryer, then adjust the timer and temperature. No oil is needed for raw meat either. The rapidly circulating hot air cooks the meat at all angles resulting in a crispy outside and moist inside effect. Excess fat from the meat dripped down onto the tray below the cooking basket. Meat patties, fried chicken wings, roast chicken, steaks, pork chops, crackling skin roast pork, hot air fried fish – you can fry your favorite meat dishes in the hot air frying machine with healthy delicious results. The hot air deep fryer is fantastic with French fries, even better than oven baked ones. No more oil soaked French fries for you with the home hot air fryer compared to those cooked in the deep fryer. 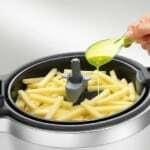 When addition of oil will result in a crispier, tastier effect such as homemade French fries, then you only need to add about a tablespoon of healthy oil. You can now truly cook up low fat meals that are healthy and nutritious and of course tasty too. Cooking with the air fryer is a fairly simple process. 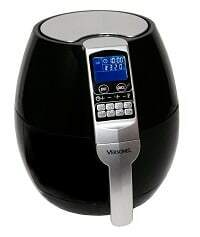 There are 2 types of popular hot air fryers in the market, the bowl and stirring paddle Tefal Actifry and the mesh bottom cooking basket sitting on a drip tray. Only the Tefal brand air fryer comes with a stirring paddle while the cooking basket design is used by the rest of the hot air fryer brands in the market. Some of these hot air fryers come with their own set of air fryer accessories. With the T fal air fryer, all you have to do is just put the cut food ingredients into the cooking bowl. The whole cooking process is done by the machine, with the stirring paddle gently stirring the food as the bowl rotates. This frees up your time for other chores such as making a salad to go with your meal. The timer will beep when cooking is completed. As for the basket style air fryer, it is recommended that you shake the smaller cuts ingredients or flip the bigger cuts ingredients over half way through cooking. Other than that, the whole cooking process is quite automatic. Unlike the traditional stove or hob cooking, you do not have to stand in front of a hot stove throughout the cooking process. When you’re rushing to work in the morning, the last thing you’ll want is to clean up the mess after cooking breakfast. Hands-free and fast cooking with hardly any cleaning makes the air fryer a winner over your skillet or frying pan. Well, to be nice and cool after a round of hot air frying compared to feeling hot and sweaty after a round of hot stove cooking is definitely a more enjoyable cooking experience. With just 2 buttons to press, it is really simple to use the air fryer. Set the timer as well as the temperature and the meal is ready when the timer goes off. 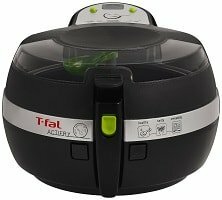 With the Tefal Actifry, it is even more simple. There is only the timer to adjust as the machine comes with a fixed temperature setting. Some of the hot air cookers come with preset programs. If you’re unsure of the correct temperature or cooking time, just press the button for the food item you are cooking. Press the chicken icon button when cooking chicken etc. These short cut starter buttons take the guess work out of hot air frying, simple and fuss-free. The compact air fryer does not need to be preheated before cooking. Frozen nuggets, French fries, potato wedges etc can be transferred from freezer straight to fryer. Set the cooking temperature and timer, beep! beep! 10 – 20 minutes later and your food is ready. The food is cooked inside the enclosed fryer cooker. There is no mess to clean up, no oily floor to mop. Feel like munching on some roasted groundnuts or walnuts while watching your favorite television show? No big deal. 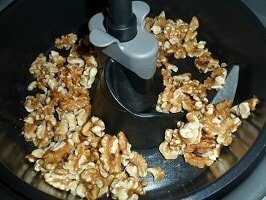 Wash the nuts, put them in the air fryer and the aromatic nuts are ready in just 10 minutes. Reheating left-over food is just as convenient. Most fryers need just about 10 minutes reheating time. Crispy food when reheated will still be crispy. Isn’t this better than buying salt and fat laden fast food at the corner store? The air fryer cooker is more practical to use compared to the convection oven when cooking smaller portions of food. The air fryer cooks faster and is more economical too. The hot air cooker is a really handy and convenient cooking appliance. Cooking is safe, fast and healthy at any time of the day and night. The home hot air fryers come with safety features. Most come with auto shut down feature when cooking is completed. This greatly reduces the risk of over heating and burnt food. The machines come with non-slip feet. 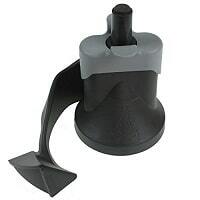 This minimizes the risk of the machine sliding on your counter top and toppling down. The closed cooking system ensures a splatter-free cooking experience. There is no risk of getting scalded by hot oil. Those machines that are ETL certified means that they conform to certain widely accepted product safety standards. Yes, your teenagers should have no problem cooking their own meals in the air fryer. In fact, according to the Philips manufacturer, even an eight year old can use their Philips hot airfryer. A machine that not only fries but also bakes, roasts and grills is indeed a highly versatile appliance. The multi cooker hot air fryer is like having a deep fryer, a skillet, a toaster, an oven and a hot grill all merge into one compact machine. You can really make full use of your air fryer for breakfast, lunch and dinner. How about toasted sandwiches for breakfast, fried chicken wings for lunch and grilled pork chop for dinner with air fried French fries as snacks. In today’s fast paced world, the highly versatile hot air fryer makes the whole cooking process simple, easy, convenient, fuss-free and manageable even for someone who doesn’t like to cook. On top of that, you are serving healthy low fat meals to your loved ones. All removable parts of the hot air cooker are dishwasher safe. Even if you do not have a dishwasher, soaking and a gentle rub with a cleaning sponge will remove all the bits and pieces of food that might be stuck on the cooking surface. Since hardly any oil is used in the air fryer, you get to save on oil. You can even choose more expensive exotic organic cooking oil since only a tablespoonful is needed for air frying. The air fryer comes with a cover, all the cooking is done inside the machine. Unlike the deep fryer or even the frying pan or skillet with an exposed cooking surface, you do not get oil vapors deposited on the counter top, walls or floor. 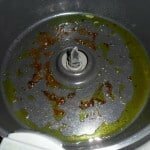 The only cleaning that is necessary are the removable cooking basket, drip pan or the cooking bowl. And you do not have a pot of used oil to get rid of. Even someone with hardly any cooking knowledge can whip up delicious meals with the air frying machine for home use. You just have to grasp the correct time and temperature according to the taste and texture you prefer. All the hard work is done inside the machine. Whenever you crave deep fried food, think of your healthy hot air fryer. Whenever you feel too lazy to cook, think of how simple and fuss-free it is to cook healthy low fat meals with your hot air fryer. With the air fryer cooker at home, no more salt and fat laden food to clog up your arteries!